Much of this information is based on my experiences and what I've learned from others. As I am just starting this page, I would be happy to hear from any of you who have new information to add to this page. These are basic topics which I don't think deserve a section of their own. So other basic and helpful information about Sevilla can be found in sections like transportation, maps, money, health & safety and weather. In those cases I thought the topics needed more explanation than just a few paragraphs. The first stop should always be the tourist office, where you can get free maps as well as information on the sights, exhibits and cultural events. Granada's most centrally located office is run by the Junta de Andalucia (regional goverment) and is just off Plaza Nueva in Calle Santa Ana. This covers mainly the city of Granada. There are also offices run by the city goverment (further outside the center) and the Diputación de Granada (Granada province and city). All have good web sites which I have listed below. Making phone calls to the U.S. is best using a telephone card purchased in a estanco (Tobacco Shop) or kiosco. Most used to offer a toll-free number (900 numbers are toll-free here), where you could choose your language, enter a pin number and the number you are calling. These cards had the best rates from Spain to the U.S. or other countries. Then the phone companies came along and changed the law so there would be no more toll-free numbers for these calling cards, this making it more expensive to call for consumers, and let the phone companies compete with their hgiher rates. Be sure to check the expiration date for the cards - they often have a 30 day limit once you make your first call, so be sure you'll use all of your minutes before the card expires. One phone card I've seen come highly recommended is the Eurodirect phone card. It offers calls to the US, Australia and other countries for 3.7 cents per minute, 24 hours a day, 7 days a week. There are no connection fees, which makes this hands down the best card you can use when calling overseas. You can find it at a number of newsstands and internet cafes in Sevilla. If you wish you can also bypass the operators and call an AT&T, MCI or Sprint operator. This option is best if you have a calling card from any of these companies, but expect those rates to be higher than what you will find with a locally purchased card. Finally, using coins at a telephone booth or calling direct from a hotel room will always be the most expensive options. A few notes about calling: Be wary of special calling cards not from the main long-distance companies which claim you can use them from anywhere in the world. One card a relative of mine bought in Costco or Sam's advertised it could be used all over the world, but when they got here they could never get through to an operator and never were able to use the card. Also keep in mind that local calls in Spain (and most of Europe) are not free unless the owner of the line has contracted a plan. Finally, over the last few years, phone companies have offered affordable flat rate plans for local and national calls. For landline to mobile calls: calling a mobile phone from a fixed line or pay phone will be much more expensive. For example, a call from a pay phone to a mobile phone may be about of 0,60€., while the same call to a fixed (home) line is only 0,20€, or free if you have a flat rate plan like I mentioned above. The main post office (Correos) is in the center of the city (Puerta Real 2). There are post office boxes, a fax service, and more. Note you can always purchase stamps for letters and post cards at the local tobacco shop, or estanco. When shipping something urgent from Spain to the U.S. or another country I recommend using UPS, if only from my brief experiences in mailing documents. My last mailing cost about 32 Euros to get one set of documents to the U.S. in two days. I shipped this using the local Mailboxes, Etc. In Granada there is an office on Calle Verónica De La Virgen 1 (www.mbe.com). All of the tracking information was sent to my email address where I received updates on the shipment including final delivery. It arrived on time (48 hours) and I was fairly pleased with the service. I have heard Fedex is not recommended to use because they contract out their services to another company in Spain. This may be the case, but I have never used Fedex so cannot speak from experience. The Spanish mail system, Correos, also offers a rapid delivery service, but I just don't trust them yet to get it there as quickly as UPS. Getting your laundry done while on the road can be a pain. I am working on a list of laundry services and locations in the city center. Should you have any experience or would want to recommend something for other travelers, please send me an email! The three major Spanish newspapers here are El País, ABC and El Mundo. One note and something you have to hate about El País - you must be a paid subscriber to read the paper online. This makes no sense whatsoever to me and while it's a good paper this policy is just plain stupid. 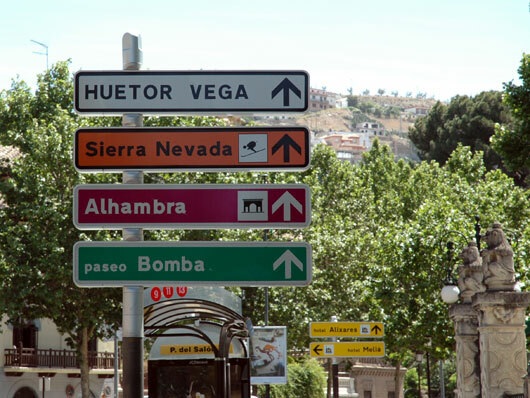 There are local editions of each of the above national papers, as well as local papers such as Granada Hoy. A free paper called 20 Minutes can be found at cafes and bars, or in the early morning you may see people handing them out in the center. The International Herald Tribune, now run exclusively by the New York Times, is offered daily except Sunday. The Tribune also include's a small 8 page version of El País in English. USA Today also offers an international version of the paper. Finally, a smaller version of Newsweek is available at some newsstands as well. Of course in the age of the Internet you can always head to a cyber cafe and read up on everything you need. If you are searching for press from England, Germany and France you shouldn't have a problem finding the major newspapers. Below are some sample prices for random things you may want to buy, eat, read or do while here. Not here are prices for museums and tourist attractions. I will soon add those to my list. As for tipping leave a few Euros at a very nice restaurant. Leave more if you have a bigger group or a fairly large bill. In general you don't tip here for less expensive meals and never for drinks. You don't tip taxi drivers either, but rounding off the change sometimes is nice. In general reward someone for doing something nice, providing good service or going out of their way, but these folks aren't expecting a large tip since they don't work for below minimum wage as is the case in the U.S. or other countries where tips make the difference in a living wage. Not much more to add other than I am happy not doing the math - estimating 15% plus tax - every time I eat out. Many of these I hope you'll never need to know. Others can be quite helpful in the right situation. Listed below are the dates of national and regional holidays which fall on fixed dates. Expect banks and other government offices to be closed. Beware of other holidays which create puentes, or long weekends. These can make finding a good hotel room a difficuly process. Aside from Semana Santa you can in most cases show up and find something, but your choices may be less than ideal in terms of location and/or comfort. Also note that for some holidays that fall on a weekend, the date of business closings may be on a Friday or Monday, so be sure to study the calendar to anticipate closings which are around the dates below. Listed below are the dates of Semana Santa, Feria de Corpus and Corpus through 2010. Note that the Feria de Corpus in Granada depends on the date of Corpus Christi. Corpus falls on a Thursday, so the Feria de Corpus will begin on the Monday of the same week (before Corpus).